The Zuellig Building is the first tower in the Philippines to be erected since 2000 - and it's also the first building in the country to be pre-certified as LEED Gold. 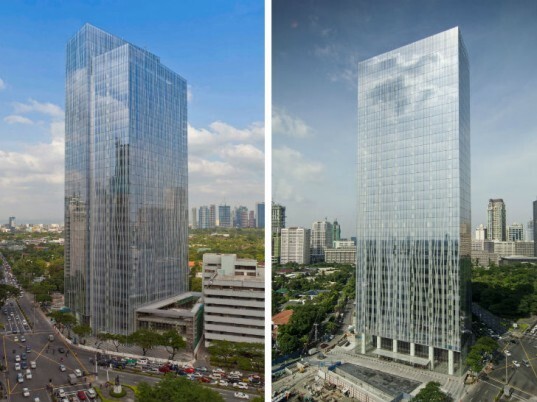 Designed by SOM, the 33-story tower provides new office space at a prominent intersection in Manila’s Makati Central Business District. The tower features a glass facade with a locally-inspired organic frit pattern to reduce heat gainalong with other sustainable strategies like greywater recycling, rainwater collection and energy-efficient systems. SOM and the developer expect the project receive its official LEED certification in 2013. The Zuellig Building is a 160 meter tall building with up to 65,000 square meters (700,000 square feet) of Class-A office space. Also included in the project is retail space, an underground parking garage, a food court, an executive lounge and an open air terrace on the 30th floor. Each floor contains around 1,800 sq ft of open floor and column free office space that will let users tailor to their needs. All of the utilities, wiring and communications run under floor, which can be easily reconfigured for new tenants resulting in flexible and useful office space for the long run. The building is notable for its environmentally conscious design and distinctive façade. Spreading out to the limits of the site, the building fans out to the north engaging with the city to the east and the west and reducing exposure to the south. The exterior is clad in glass that features a ceramic frit pattern that references local organic motifs and reinforces the vertical proportions of the tower. Fritting helps reduce glare and solar heat gain while still allowing 90% of the interior to be naturally daylit. The building envelope, a sensor-controlled lighting system and efficient HVAC system all help reduce the building’s energy consumption by 15% (4.3 million kWh annually) as compared to a conventional building. In addition, grey water is recycled and rainwater is collected to save an expected 29 million liters of water annually. Bridgebury Realty Corporation, the developer, is seeking official LEED certification (possibly Platinum), which they expect to achieve by September of 2013. The Zuellig Building is a 160 meter tall building with up to 65,000 square meters (700,000 square feet) of Class-A office space. Also included in the project is retail space, an underground parking garage, a food court, an executive lounge and an open air terrace on the 30th floor. Each floor contains around 1,800 sq ft of open floor and column free office space that will let users tailor to their needs. All of the utilities, wiring and communications run under floor, which can be easily reconfigured for new tenants resulting in flexible and useful office space for the long run. The building is notable for its environmentally conscious design and distinctive façade. Spreading out to the limits of the site, the building fans out to the north engaging with the city to the east and the west and reducing exposure to the south. 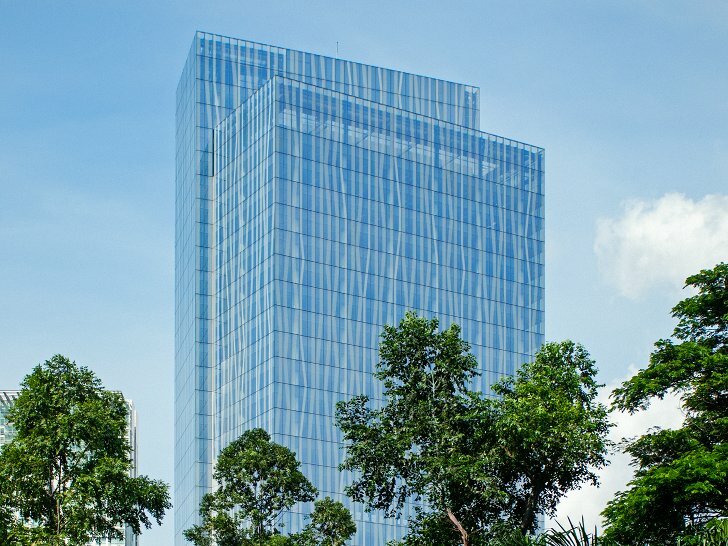 The exterior is clad in glass that features a ceramic frit pattern that references local organic motifs and reinforces the vertical proportions of the tower. Fritting helps reduce glare and solar heat gain while still allowing 90% of the interior to be naturally daylit. The building envelope, a sensor-controlled lighting system and efficient HVAC system all help reduce the building’s energy consumption by 15% (4.3 million kWh annually) as compared to a conventional building. In addition, grey water is recycled and rainwater is collected to save an expected 29 million liters of water annually. SOM is seeking official LEED Gold certification, which they expect to achieve by September of 2013.